Just 150 miles east of Abilene, one of the largest exhibits of Dead Sea Scroll fragments ever assembled is available for viewing through Jan. 13 at the Southwestern Baptist Theological Seminary in Fort Worth. The exhibit, Dead Sea Scrolls and the Bible, includes original scrolls with texts from Genesis, Exodus, Leviticus, Deuteronomy, the Psalms, Isaiah and Daniel. 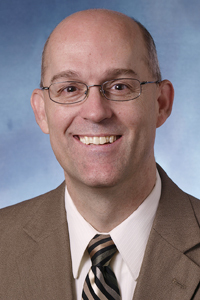 Dr. Curt Niccum (M.Div. ’92) is a professor in the College of Biblical Studies with a unique background in ancient manuscripts. 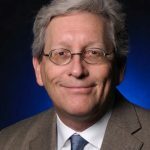 He has worked on several international collaborations including the Dead Sea Scrolls Project (for which he edited one of the scrolls of Daniel), the International Greek New Testament Project (for which he collated manuscripts), and the International Project of the Text of Acts (for which he studied the origin of the Greek text underlying the Ethiopian version of the book). 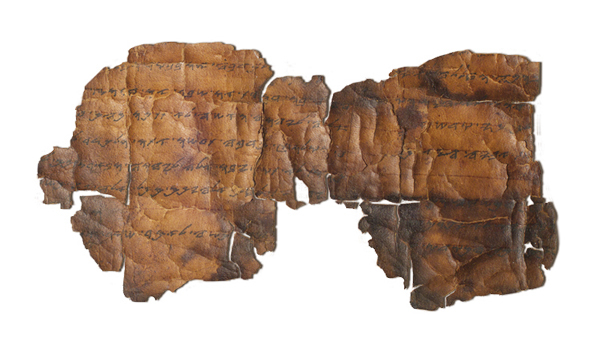 What are the Dead Sea Scrolls and how were they discovered? Since 1947, the remains of nearly 900 scrolls have been discovered in caves in the vicinity of Qumran, the archeological site of an ancient compound in Israel on what is now known as the West Bank, about a mile northwest of the Dead Sea. Of these, more than 200 contain books of the Hebrew Bible. Every book but Esther is represented among the scrolls. (Contrary to the claims of some, there are no manuscripts of the New Testament nor do they mention Elvis Presley.) The other documents contain a wide variety of primarily religious materials. Side note: Technically, the term “Dead Sea Scrolls” signifies all the documents discovered since 1947 along the western shore of the Dead Sea. Most people, scholars included, incorrectly use the phrase to refer to the specific manuscripts found near Qumran that date from about 250 BCE (B.C.) to 67 CE (A.D.). However, there were other caches found that include biblical/religious manuscripts and documents dating into the second century CE. Nevertheless, for the purposes of this Q&A, I will go ahead and use the phrase as it is commonly known. What has their discovery done for the study of the Old Testament? In brief, our knowledge of the text of the Hebrew Bible has advanced 1,000 years. Most English Bibles printed before 1952 have the first 27 books translated from a manuscript copied around 1008 CE. Most translations made since then still have this text as their base, but to varying degrees take the Dead Sea Scrolls evidence into account. One quick way to tell is by looking at the end of 1 Samuel 10. If the last verse is unusually long, then the translators chose to incorporate the new material. We have known for some time that part of that text was missing, but it was a manuscript found in Cave 4 that made it possible to recover the Hebrew text of the missing passage and explain how it was omitted – a scribe accidentally skipped a paragraph because the same word appeared in two places and his eye jumped from one to the other as he copied text onto another scroll. How do these discoveries from the Hebrew Bible affect New Testament scholarship? Their contribution to New Testament studies is even more significant, in my opinion. Although none of the New Testament books appear among the Dead Sea Scrolls, the nearly 700 non-biblical texts help fill in the picture of Palestinian Judaism during the time of Jesus and his earliest disciples. This is significant because many scholars before the 1950s questioned the veracity of the Gospel accounts and Paul’s references to Jewish beliefs and hopes. The primary sources from the period were works by Josephus – who tried to distance the majority of Jews from the Jewish Revolt (66-73 CE) and to portray a Judaism palatable to the Romans – and by Philo, who began writing a commentary on the Pentateuch showing that Moses was the originator of all the best in Greek philosophies. Although both authors share some perspectives and details found in the Bible, they differ far more. As a result, many questioned the historical value of the New Testament and wondered if Scripture’s own agenda proved too strong for any semblance of reality to be found therein. The Dead Sea Scrolls changed that. In light of the large amount of material we now have from a group of conservative Jews dwelling in Palestine in and before the first century, the New Testament looks like it belongs. Clearly the community at Qumran and early Christians differed on many topics, but the general picture of life in Palestine is remarkably the same. Our understanding of the New Testament, therefore, has increased greatly in the last 60 years and will continue to expand at a significant rate for decades to come. How did you first become interested in these and other early manuscripts? My junior year at Lubbock Christian University, I took a class, History of the Bible. I became fascinated with establishing the original text and understanding the changes that took place at different times and at different locations. Tell us a little bit about the scroll of Daniel and the process of editing its translation. At the University of Notre Dame, I worked in varying degrees on five volumes of Discoveries in the Judaean Desert, the official publication series for the scrolls. As a reward for that labor, I was invited to edit fragments of a scroll of Daniel labeled 4Q Dan-d (i.e., a manuscript found in Cave 4 near Qumran containing the fourth known copy of Daniel). The manuscript consisted of a dozen fragments in deplorable condition. The scribe used highly acidic ink that eventually ate through the leather. Trying to read it was similar to deciphering text in a photographic negative. Each manuscript in the series requires a full description, including the size of each fragment, a reconstruction of the overall dimensions of the original manuscript if possible, the height of letters, width and height of columns and margins, use of sense divisions, different spellings, and evidence of any corrections. In transcribing the text every possible letter needs to be identified. Once the text and scribal practices have been established, the text is compared to other Hebrew, Aramaic, Greek, Syriac and Latin witnesses so scholars can easily identify where and how the text of 4Q Dan-d differed from other known versions of the book. What are some of the challenges in working with and storing such old manuscripts? Typically texts of that age are very brittle. Further, variations in pH balance, temperature and humidity speed up the rate of deterioration. Thus, it is important to create environments that control all of these factors. If you go to the Dead Sea Scrolls and the Bible exhibit at Southwestern Baptist Theological Seminary, you can see this first hand. The rooms in which they display facsimiles are well-lighted. The originals, on the other hand, are in darkened rooms, encased in special receptacles designed to maintain the best possible environment under those circumstances. Because this type of deterioration had already affected many scrolls and we wanted to prevent additional unnecessary damage, study began with infrared and digitized images. These almost always are more legible than the actual scrolls, some of which look like charcoal to the naked eye. However, working with photos does not provide a complete picture. The work is always double checked by consulting the actual scrolls. When I was in Jerusalem, actually eying all the pieces together facilitated fragment placement. Even as late as the mid-1990s, I was able to identify and place pieces with the proper scrolls of Psalms and Isaiah. Also, the earliest photographers shot only the inscribed side of the manuscripts. While working from an image of a section of Genesis, a coworker noticed that a corner had been folded back. In Jerusalem. we flipped the piece over and were able to recover text for which there was no photographic evidence. Considering those challenges, what are the benefits of having this collection available to the general public? I have guided a couple of tours of the Dead Sea Scrolls and the Bible exhibit, and everybody has been overwhelmed by the materials assembled. The history of the Bible in this period and in subsequent centuries fascinates them. Seeing the manuscripts both makes them more “real,” and illustrates how large the gap indeed is between the first century and the age of print. Most visitors are unaware of the rare opportunity afforded by this particular exhibit. Because the scrolls are fragile, expensive to guard and insure, and considered possible targets of terrorism, the Israeli Antiquities Authority permits just a handful of documents to appear publicly at any one place and time. This display is considerably larger because it incorporates pieces from the collections of other organizations and families. It is an impressive array. What advice do you have about visiting this particular exhibit? Any helpful background information or don’t-miss parts of it? The first piece of advice is “Go!” Everything they have is worth seeing, but some special items should be noted in particular: 1) the facsimile of the Great Isaiah Scroll (1Q Isa-a), one of the first documents discovered and a virtually complete copy of Isaiah, 2) the recently discovered “Gabriel Hazon,” a stone tablet from around the first century on which a messianic vision recounted by the angel, Gabriel, is written in ink, and 3) leaves from two important New Testament manuscripts, p46, the oldest known sizable copy of Paul’s letters (late second century), and p38, an early witness to a version of the Book of Acts quite a bit longer than the one found in most English New Testaments. What involvement have you had in working with other early biblical texts during your career? In theory, virtually everything I study is related to ancient manuscripts, typically of the New Testament. Currently I am working with the Bible translated into Ge’ez, the language of ancient Ethiopia. Dr. Steve Delamarter of George Fox University and I are heading the Textual History of the Ethiopic Old Testament Project, which is an international effort to increase our knowledge of this little known version that originated in the fourth century. I also am working on critical editions of 2 Corinthians and Galatians in Ethiopic as well as updating the edition of Revelation. I have been invited to assist the Novum Testamentum Editio Critica Maior group to assess the value of the Ethiopic for understanding the transmission history of the Greek New Testament, and I am in discussions with the International Greek New Testament Project to see if the same can be done for their work. For the Hill Monastic Manuscript Library, I am cataloging about 80 Gebra Hemamat manuscripts containing the liturgy for Passion Week and including several biblical books. Of particular value for ACU, the Green Scholars Initiative (GSI) recently named me the Distinguished Scholar of Ethiopic Texts. The GSI, fueled by the vision and generosity of the Green family of Oklahoma City, aims to engage undergraduate and graduate students in research with primary biblical materials and world class scholars. This means future ACU students (and not just Bible majors) will have a chance to work with ancient manuscripts and early printed materials on our campus and at other locales. Which faculty in ACU’s College of Biblical Studies have most influenced you, and why? I came to ACU to study under Dr. Carroll Osburn, who was among the very top in the field of textual research. He not only trained me well for the work I do, he instilled a love for living scripture rather than just studying it. Dr. Everett Ferguson (’53) also has had a great impact on me. As a student, I longed to know as much as he knew. (I still wish I knew as much as he knew then but wish even more what he knows now.) He and his wife, Nancy (Lewis ’55), are still role models, and the short time I have been at ACU has been enhanced by their friendship. I only had one class with Dr. Tom Olbricht, but he challenged my myopic view of the Bible and modeled an intense love for the church that I hope to emulate. Although these three no longer spend much time on campus, it is the typical ACU story – professors who care enough to challenge and educate in and out of the classroom, engaging students as colleagues, rather than a room of faceless individuals. Curt, I would love to round up our scholars at Austin Grad for a trip to Fort Worth to see the exhibit. Any chance you are planning to be there before mid-August or after mid-October? As a student, I longed to know as much as he knew.